Thank you to all of our wonderful volunteers! We are so grateful to the thousands of volunteers that provide tens of thousands of volunteer service hours each week. 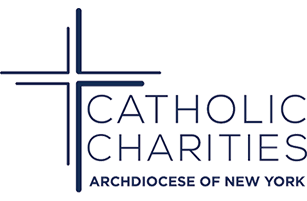 Your work is incredibly impactful and makes a huge difference to our programs, staff, as well as thousands of New Yorkers in need, both non-Catholic and Catholic alike. Each year we host a number of annual opportunities -- here are some photos and videos that highlight your efforts. 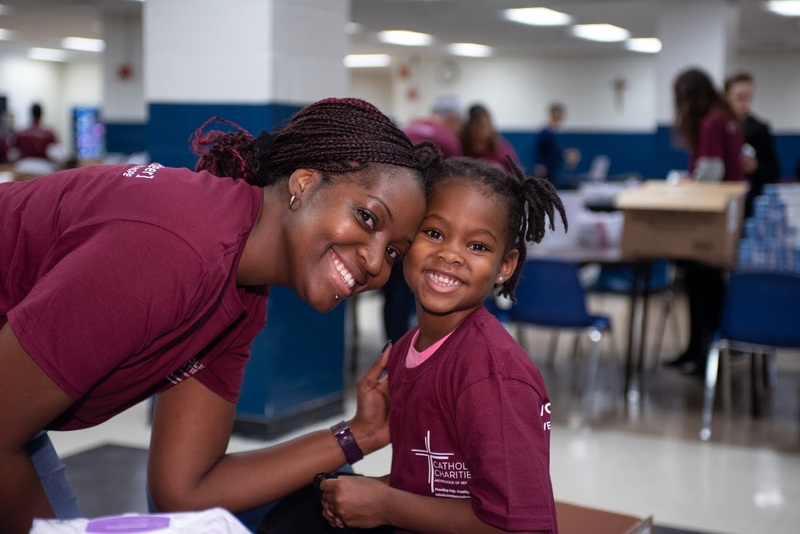 Each September 11, Catholic Charities collaborates with MyGoodDeed and other partners (nonprofits, major faith-based community groups and corporations) to help turn a day of tragedy into a day of doing good. MyGoodDeed transforms 9/11 into a Day of Service - in 2018 6,000 volunteers in NYC gathered to pack 1.6 million meals on the USS Intrepid. Each November over 100 family volunteers gather to help at Family Volunteer Day. 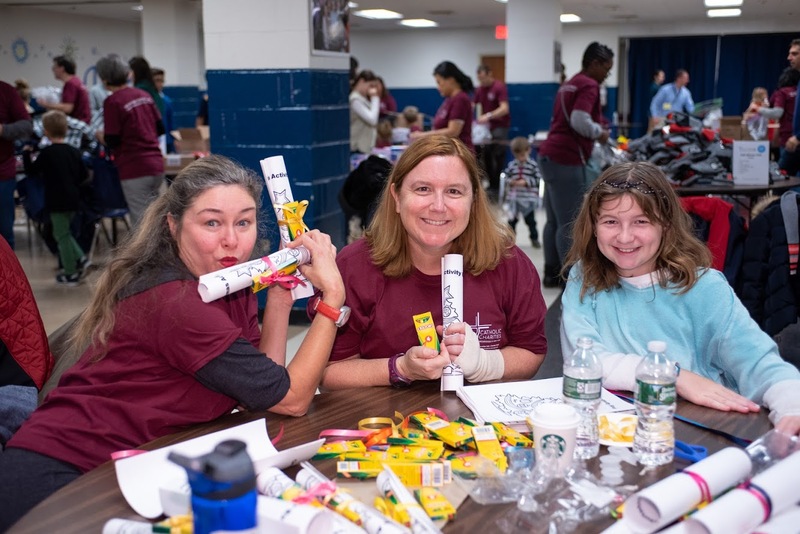 Families come with children of all ages -- in 2018 family volunteers compiled four different kits (assembly line style), including 500 toiletry kits, 500 winter kits, 500 newborn kits and 720 coloring kits. These kits were distributed to many of the charities in our Federation of Agencies. The St. Nick Shopping Day is our headline holiday event of the year. For more information, please visit us here. Catholic Charities organized a Day of Service on a recent trip to Puerto Rico. After hosting a book drive in New York City, Catholic Charities brought books and backpacks down to Puerto Rico. Volunteers distributed these items to Pre-K children participating in one of the New York Foundling (one of the charities in our Federation of Agencies) Puerto Rico head start programs. Volunteers also served a delicious meal to these children and their families. More than 200 volunteers partnered with Disney to build a new playground for preschoolers in the Bronx at the Astor Services for Children and Families' (one of the charities in our Federation of Agencies) Lawrence F. Hickey Center for Child Development. See the news coverage here. 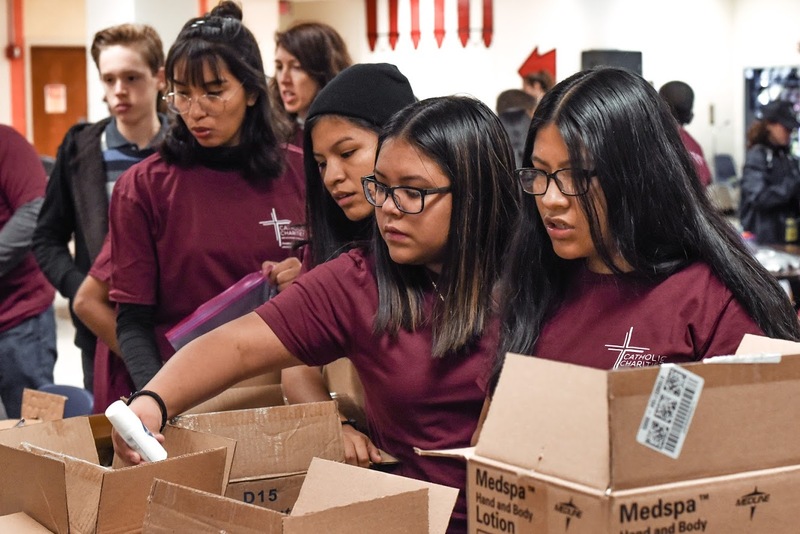 Volunteers participated in seven service activities around the Archdiocese to commemorate 100 years of supporting New Yorkers in need.